A besom is a traditional broom made of twigs tied together. 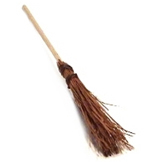 In fact nowadays it can refer to any type of broom. The word features in the chorus of the bothy balad, the Muckin o Geordie's Byre: 'When the graip wis tint, the besom wis deen,...' (see the entry for 29 August 2016 where you will find a link to all the words of this balad together with a short glossary). But beware - this word is also used as a word of contempt for a disreputable woman!